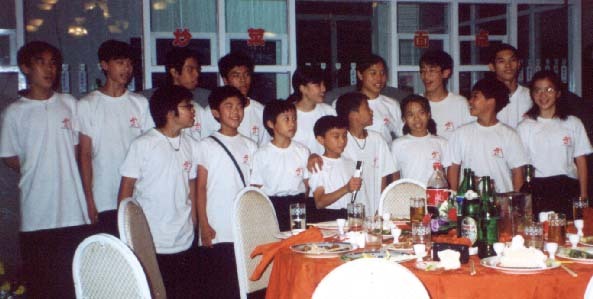 I didn't actually go to this tournament, but here a few photos of the openning ceremonies of the tournament, the Beijing Team demo and related dinner that Mary Lee provided for me to scan. Please let me know if I've got any of the captions wrong, ok? By the way, the information on the tournament can be found here. If you're looking for more information (which I'm sure you are, since this is so limited), I encourage you to go to www.sinowushu.com. They have extensive coverage and results in Chinese, and some in English too. Also, if anyone else who attended the competition has some pictures they want to share, please let me know, we can put them up here. 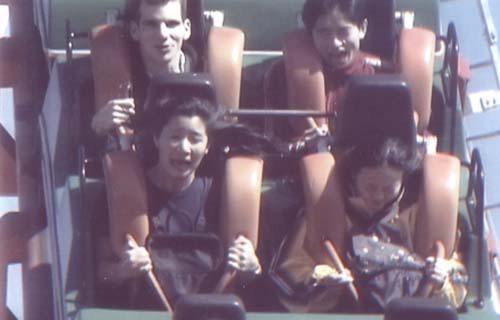 A close up of the team members, That's Shao Changjun in the front, Li Qiang on the left and Chen Chen on the right. 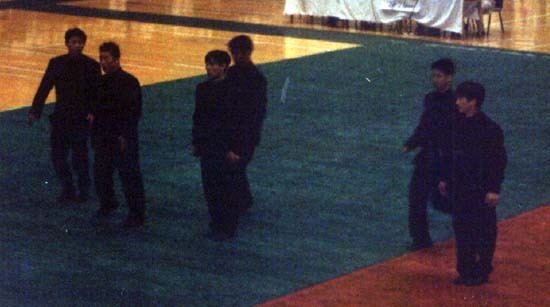 The men of the Beijing Team about to perform their latest group set, in Fist of Legend-esque uniforms. 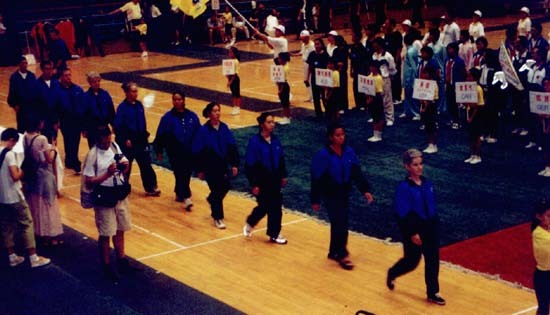 The team from the Pacific Wushu Academy of Berkeley, CA, USA, lead by coach and former Beijing Wushu Team member Zhang Hong Mei. 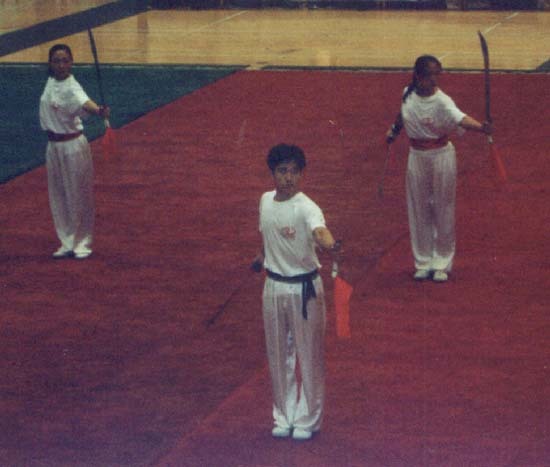 The team from the US Wushu Academy of Falls Church, VA, USA, lead by coach and former Beijing Wushu Team member Zhang Guifeng. 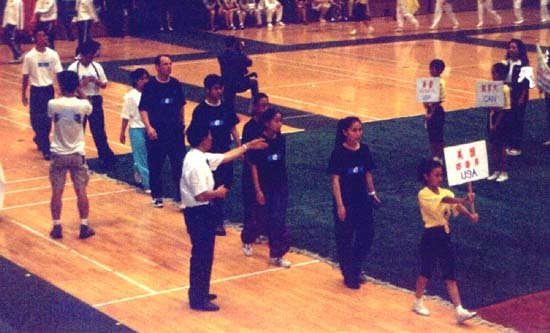 Some of the other teams participatng can be seen in the background, the group in Black and White jackets towards the right is the third team from the USA, the Lily Lau Eagle Claw Academy, of Concord, CA. At a tournament related dinner (I think), the team from Malaysia assembles to say a few words (either that or they're singing, I don't know I wasn't actually there). The group from Hong Kong. Apparently they had quite a large contingency present. Some of the guys of the Beijing Team pose for a group picture. Some of these guys are new so I don't want to risk getting anyone's name wrong. Anyway, thats my pal Shao Changjun on the right. 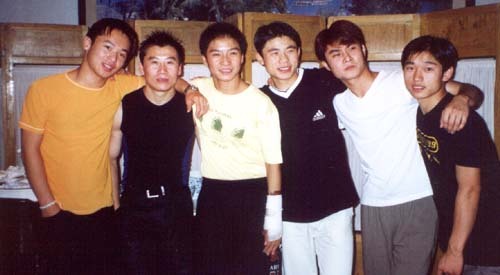 Team members from the Pacific Wushu Academy, along with Beijing Wushu Team Head Coach, Wu Bin (center), Zhang Hong Mei (Wu Bin's right), current Beijing Team athlete Qiu Dongxing (far left).